FLASH!!!!" Jenny" Wenrick's You Know It wins Best Of Winners at the 2009 MONTGOMERY COUNTY SHOWS!!!!! Originating in Britain, the Lakeland Terrier was developed in the border county of Cumberland in the early 19th century. This was a working terrier whose job it was to kill foxes and other vermin that preyed on the farmers lambs and poultry. Tough, brave and agile, the Lakeland is slender enough to follow his quarry through narrow crevices. 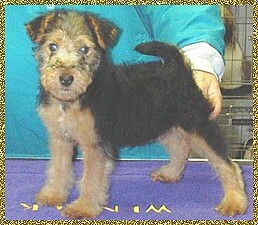 The breed is thought to be the product of cross breeding of several terrier breeds and the Otterhound. The breed was originally known by a variety of names depending on the area where it was bred - these include Patterdale, Fell, Cumberland and Westmoreland. First specimens are said to have been a rough-looking lot - a far cry from the stylish Lakie of today. The present standard calls for a withers height of 14-1/2. ; weight of 17 lbs. The coat is double, hard, dense and comes in a variety of colours from wheaten to black. The Lakeland is hardy and active and makes a good companion. 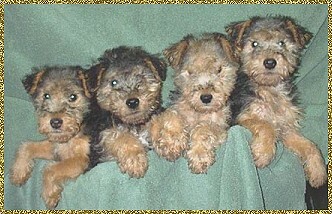 We are very proud of our Lakeland Terriers. Our first Lakie Danny, Canadian, American and Bermudian Champion Jamelyns Second Edition holds all the show records for a Lakeland Terrier in Canada. He was Canadas # 1 Dog All Breeds in 1989. Since Danny, many of our breeding have gone on to win Best In Shows and Championships. Wenrick Lakelands are bred to conform to the Standard for the breed and have outstanding temperaments. All puppies come with a full health guarantee and are guaranteed against any hereditary or congenital birth defects. They have their first vaccinations and are tattooed for identification. They are registered with the Canadian Kennel Club and are placed on a Non-Breeding Agreement which means they may not be bred. Wenrick Lakelands are easily recognized in the show ring or in a family setting. Quality and high standards are important keynote words at Wenrick and the dedication required to attain our goals is evidenced in our success. If you are thinking of making a Lakeland part of your family please read our Lakeland Terrier 'Owners Manual'. Serious inquires for quality dogs for breeding, showing or as family pets are always welcomed.